With all the delights a new season brings, it’s easy to forget that there’s a new set of weekly challenges to complete as well! Here are all of the Season 7 Week 1 Challenges in Fortnite, along with tips on how to complete them. Fortnite Season 7 Week 1 Challenges. As per, the challenges are split into two categories: Free and Battle Pass. It looks like a good varied list this week to kick the season off, so without further ado. This one’s not too hard. The toughest to track down will probably be legendary, so your best bet is to open as many chests as possible until you can grab a golden item. While people are distracted, a good place to try this is the drained bed of Loot Lake. There are loads of chests and floor spawns to get items from. This challenge includes things like traps and bounce pads, so pick those up too. If you click the link above we’ve got a full map and guide on where to go to complete this challenge, which will probably take you multiple games to complete. This is listed as hard, but in the immediate aftermath of the season start, won’t be too tough. Our best tip for this is the head to the new areas, on the western side of the map. There will be so many players, most of which will be so busy gawking at the new scenery, that you can pop them off while they’re distracted. The second stage of this is a “metal turtle”, while the last one is a “submarine”. We’ve got a full guide on how to complete this challenge, which you can check out from the link above. Damage challenges always seem harder than they are, because you can deal more than 100 headshot damage with one hit from some of the more powerful weapons in the game – like snipers. If you’re not super good with snipers, then automatic guns are also good for this, especially the high-powered, but slow-firing heavy assault rifle. Ammo Boxes are littered everywhere around the map, and if you make a conscious effort to search five in one game, then this should be a doddle. Areas like Retail Row and Salty Springs with a lot of indoor spaces tend to house tons of Ammo Boxes, so check here if you’re short. Remember the advice for the other eliminations challenge? It applies here too. 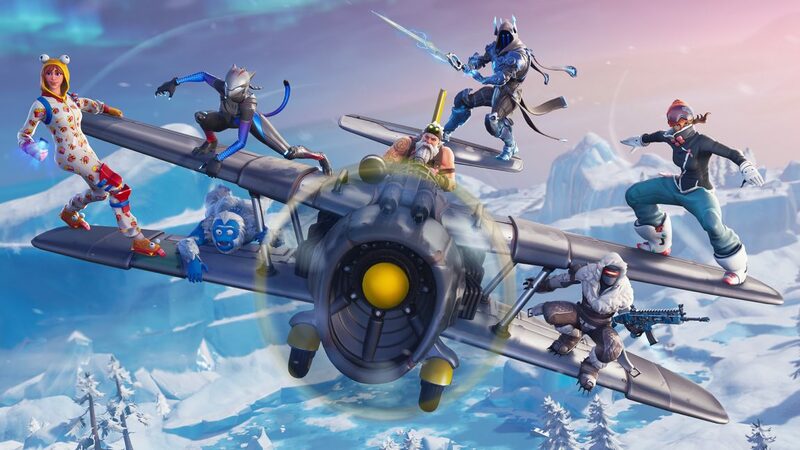 Head over to the snowy corner of the map where you can find Polar Peak, Frosty Flights, Shifty Shafts, Happy Hamlet, and the edges of Snobby Shore, Lucky Landing, Tilted Towers. You should be able to eliminate plenty of unsuspecting players in these new – and freshly icy – areas.